Hi friends, and welcome. 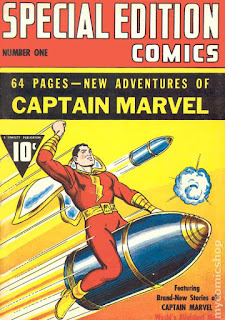 For regular followers of me, this blog, the Captain Marvel Culture website, the Captain Marvel Culture Facebook group and page, the Captain Marvel Culture YouTube channel, and who may have seen my posts and comments and answers on YouTube, Facebook, Quora, and pretty much any article or blog post that purports to tell the history of any Captain Marvel, what follows should be familiar history. However, what with the upcoming "SHAZAM!" movie in post-production, as well as Marvel's "Captain Marvel" movie following hard upon, it seems that lots of people continue to post inaccurate histories as the authoritative truth. 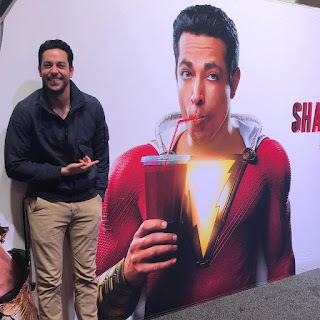 The latest of these was on https://www.slashfilm.com/history-of-shazam. It was well written, with an air of authority. It seems to me, however, that it was written by somebody who did research on the Internet for a few hours rather than tracking down the source material. There are misconceptions and inaccuracies all over it. I don't want to assume that's what the writer did, but it is obvious that they did not go the extra step to find out the difference between a copyright and a trademark, or that Whiz Comics #1 was merely an ashcan and never released to the public. There are plenty of other examples of inaccurate info being given as authoritative truth on YouTube, Quora, and Facebook and the mainstream press (which is not to say that they are dealing in "fake news." That's a whole 'nother thing). But rather than log all of them here, I would just like to see if I can straighten this whole mess out and give researchers a one-stop shop for this history. 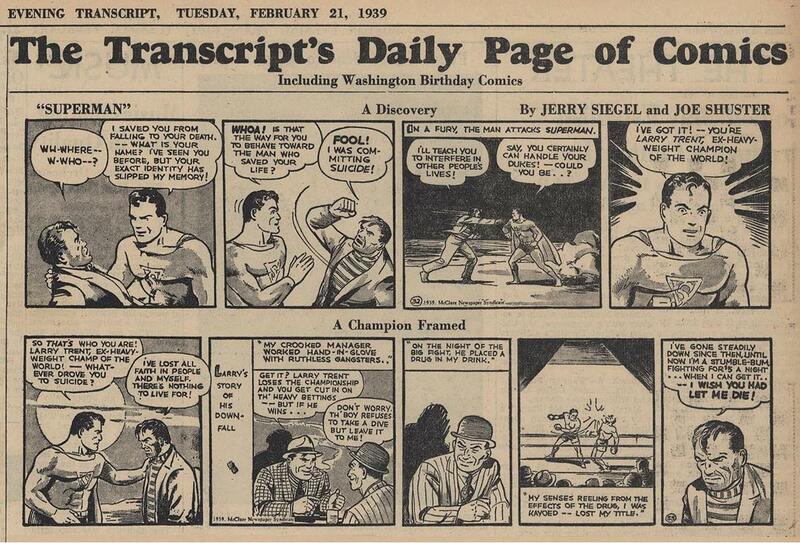 In 1938, Jerry Seigel and Joe Shuster, a writer and artist team from Cleveland, Ohio, finally found a buyer for their ground-breaking character, "Superman." Long story short, their character, generally acknowledged to be the first true comic book superhero, first appeared in Action Comics #1. About that time, the publisher, National Allied Publications, was reorganized as Detective Comics, Inc. (after its first all-original, single-subject comic book with ads, Detective Comics) and would later come to be known as DC Comics. 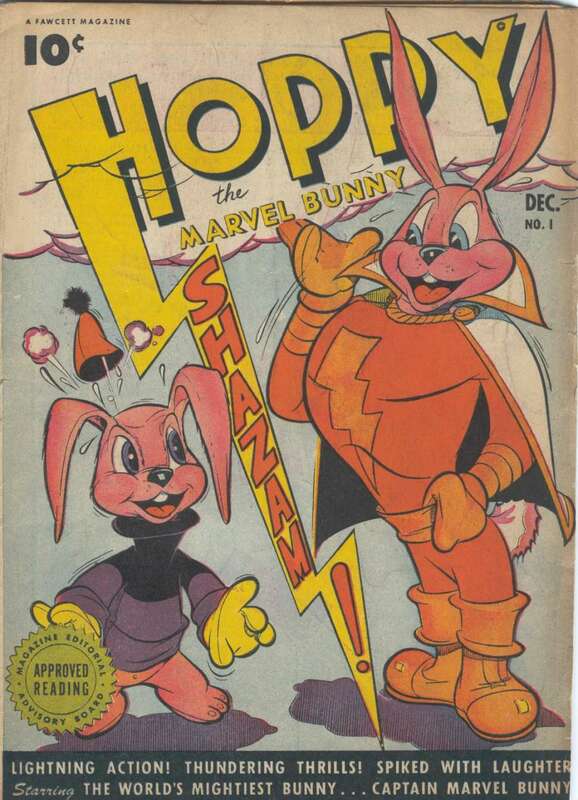 Before long other superheroes appeared, and other publishing companies, either already extant or newly created, started introducing more superheroes. Fawcett Publications had been started by retired US army captain Wilford H. Fawcett. "Captain Billy," as he was known, had published a pamphlet of patriotic writings and low-brow humor to entertain his veteran buddies in V.A. hospitals in his home town of Minneapolis, Minnesota. The pamphlet was called Captain Billy's Whiz-Bang. 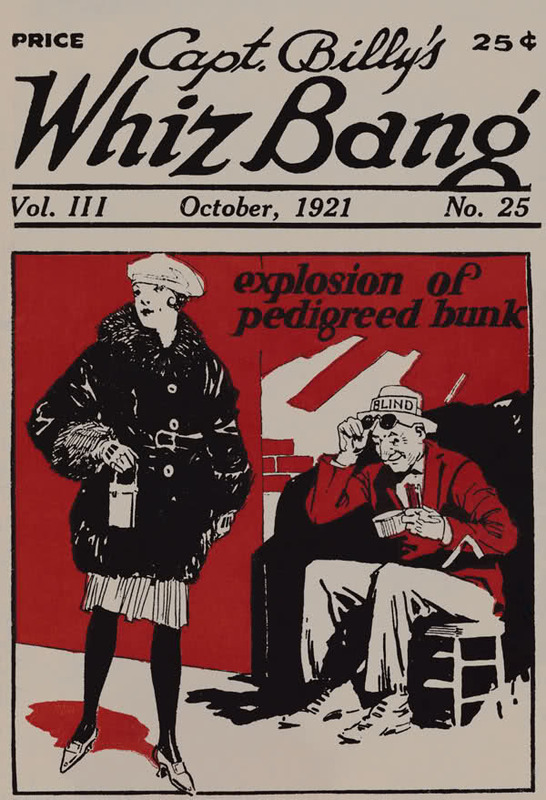 This publication became a big hit among the college set in the 1920's, spawning a large, diverse, and successful publishing company. Its titles included, over the years, Daring Detective, Family Circle, Motion Picture, Screen Secrets, True Confessions, Mechanix Illustrated, and Woman's Day. Noticing the success of superhero comic books, one of Captain Billy's sons, Roscoe Fawcett, decided to get Fawcett Publications into that racket. 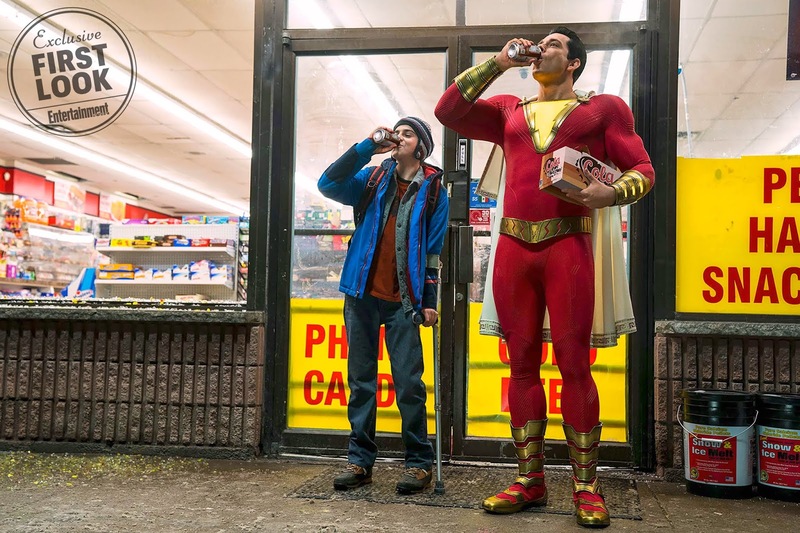 Citing surveys that showed the largest audience for superheroes was 10-to-12-year-old boys, he laid out the dictum "Give me a Superman, only have his other identity be a 10-to-12-year-old boy rather than a grown man." He put art director Al Allard in charge of the project with the assistance of editorial director Ralph Daigh, and staff writer Bill Parker and staff artist C.C. Beck were assigned to create this hero (as well as fill up a 64-page comic book with additional stories). At first, Parker came up with the idea of a team of superheroes, each with a different power. But it was decided that this would be too confusing, so Parker went with the single hero. The story he wrote began with Billy Batson, orphan newsboy, trying to sell his papers outside a subway station in the rain late at night. A stranger in a dark coat and hat came up to him and asked "Why aren't you home in bed, son? "I have no home, sir," the boy said. "I sleep in the subway. It's warm there." Without hesitation, the stranger said "Follow me!" AND FOR THE FIRST AND LAST TIME THAT THIS WAS EVER A GOOD IDEA the 10-to-12 year old orphan followed the mysterious stranger into the subway. And in a crash of thunder and a flash of lightning, Billy was transformed into the mighty hero...Captain Thunder! That's right, his name was Captain Thunder, he was to appear in the first issue of Flash Comics from Fawcett Publications, and an "ashcan" issue was produced to secure copyright and solicit distribution. But All-American Comics (sister company to Detective) had just come out with their new comic by the same title. So Fawcett decided to re-title the book Thrill Comics and produced an ashcan. But Pines Publishing was coming out with Thrilling Comics. So Fawcett decided to go with a title that referenced their very first publication, and came out with Whiz Comics, and produced an ashcan. And in all these ashcans, the hero was named "Captain Thunder." It made logical sense what with the lightning motif and the thunderous transformation. But someone didn't like it. In testimony in the lawsuit with National (more on that later), Ralph Daigh said he didn't like that name. 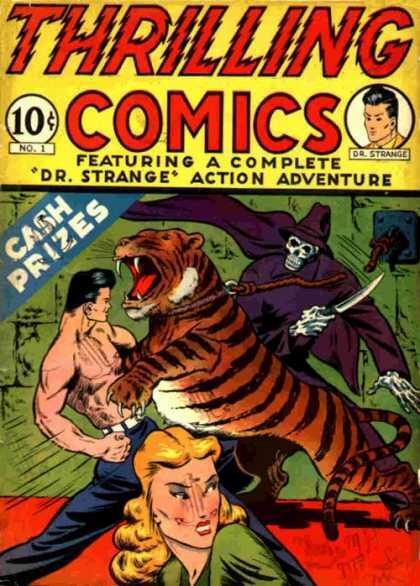 Comic book historian Jim Steranko reports that it was considered too "clamorous." So the histories say that artist Pete Costanza came up with the name "Captain Marvelous." 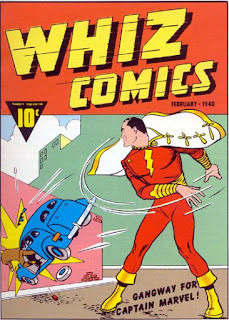 It was shortened to Captain Marvel and since the Ashcan of Whiz Comics was considered issue #1, the first issue to hit the stands was #2, cover dated February, 1940. The character was a big hit, and before long it was decided to give him a solo title. The first issue was written and drawn by Joe Simon and Jack Kirby in a legendary two-week period with some help from their friends when they took a hotel room and did after-hours work while they were creating Captain America for Timely Comics. 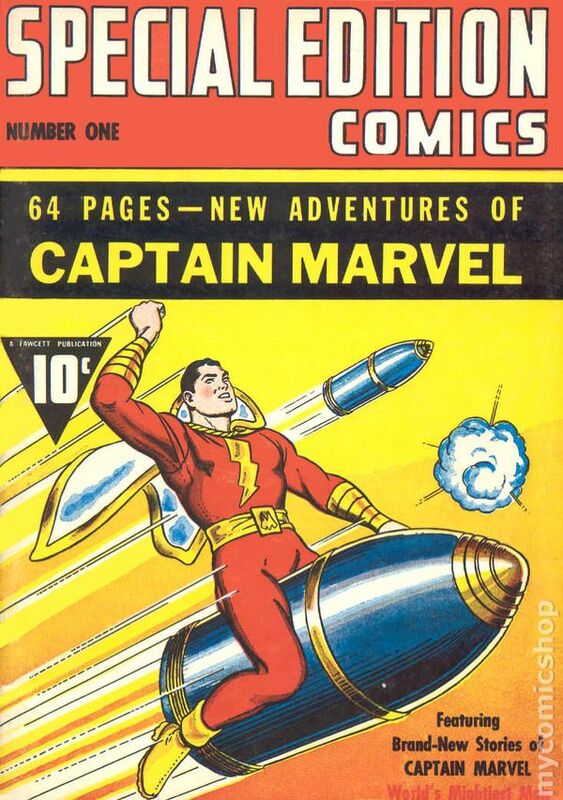 The title came to be Captain Marvel Adventures. 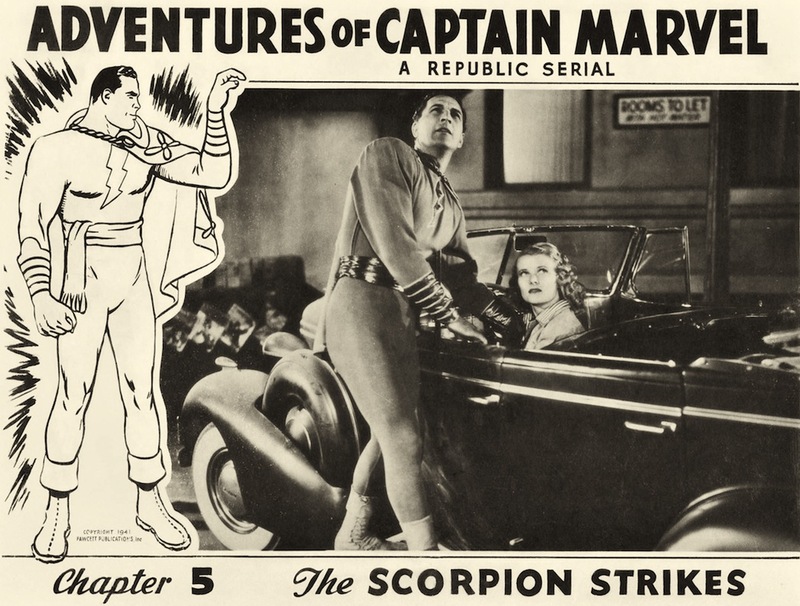 Captain Marvel was even the first comic book superhero in a motion picture! Movie serials had made a comeback recently with the success of Flash Gordon, and Republic Pictures was shopping for a comic book property. They opened discussions with Detective for Superman, but it didn't work out, so they closed the deal with Fawcett for Captain Marvel. 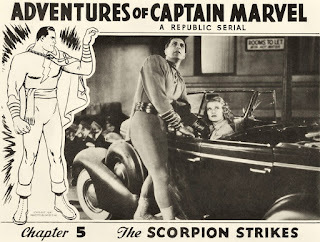 The Adventures of Captain Marvel movie serial, starring Tom Tyler as the hero, Frankie Coghlan, Jr. as Billy Batson, and Nigel de Brulier as Shazam, is generally acknowledged as one of the best ever made. 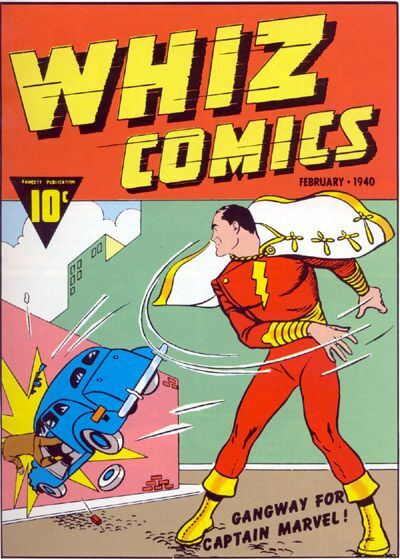 Captain Marvel's comics went on to sell more copies than Superman. Bill Parker wound up in the military during World War II and never came back to comics, but Otto Oscar Binder wound up becoming the main writer for the character and wrote more than half of all the stories of Captain Marvel and those of the other Marvel Family characters. 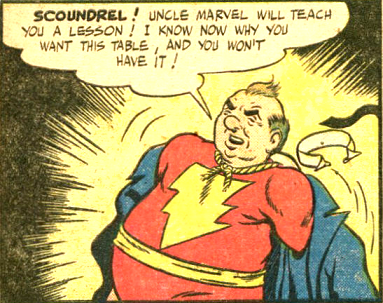 It was he who really solidified the character of the hero and the sense of fun and "whimsy" for which the Marvel Family line of characters were known. Of course, nobody likes a rival to their success, and the publishers of Superman were no exception. 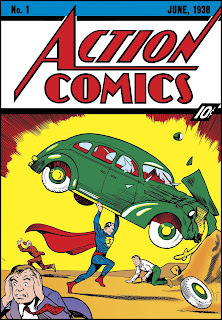 By 1941, Detective Comics, Inc. had shut down at least two Superman imitators with lawsuits. With The Adventures of Captain Marvel nearing release, they went after Captain Marvel. 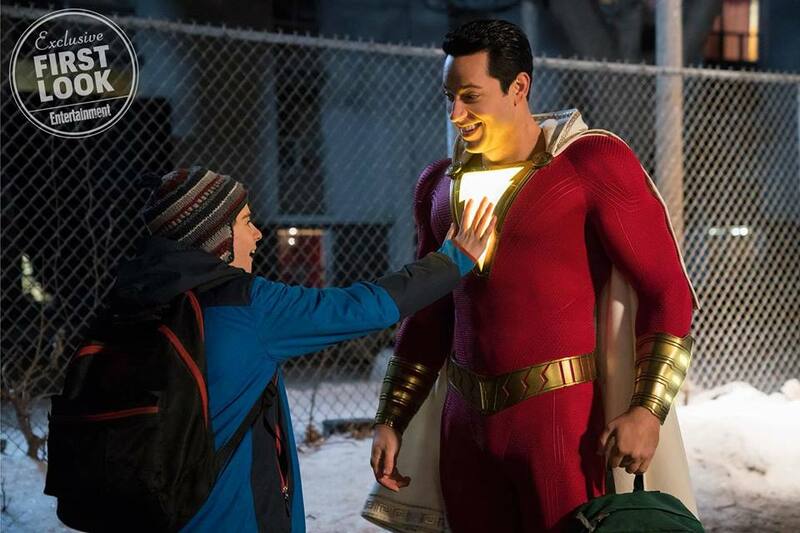 They issued a cease-and-desist letter claiming that the similarities between the two heroes were so great that it constituted copyright infringement, and that Captain Marvel stories were copying Superman stories. 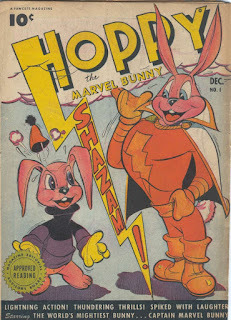 This did not stop Fawcett and Republic from releasing their Captain Marvel works. So then Detective sued Fawcett Publications and Republic Pictures in September 1941. The case finally went to trial in March, 1948. 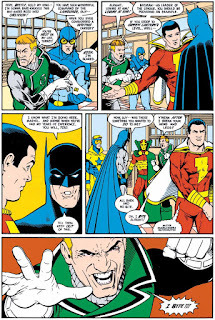 The arguments included the fact that both heroes had tight costumes, were super-strong, super-fast, and had alter-egos in journalism, and fought against injustice (Clark Kent was a newspaper reporter, and Billy Batson had become a radio reporter). Other similarities included flying and the fact that their arch enemies were bald scientists (Lex Luthor for Superman and Dr. Sivana for Captain Marvel) but in those instances, Captain Marvel came first. Instances were also shown of Captain Marvel doing things that Superman had done previously. 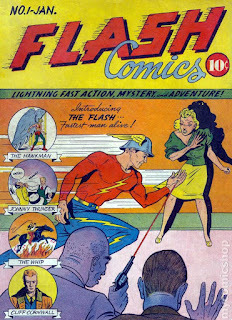 Fawcett countered by pointing out the differences between the two characters (the color of the costume, the age of the alter ego, and the fact that while Superman was a visitor from another planet, Captain Marvel was a product of magic, for instance, and that there was no "Lois Lane" romantic angle in Captain Marvel stories and no villain as prevalent in Superman stories as Dr. Sivana was against Captain Marvel). They also showed examples of not only Captain Marvel doing certain things before Superman did them, but heroes of literature and mythology, like Tarzan, Popeye, and Hercules doing things like these before both of them. 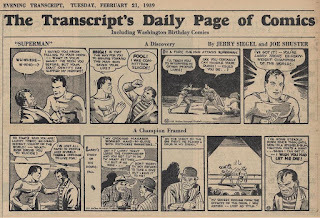 Fawcett also pointed out that the McClure Newspaper Syndicate, which distributed the Superman newspaper strip, had failed to print the required copyright notice on a bunch of Superman strips. There were also certain irregularities with the copyrights of the material in certain issues of Superman comics. Therefore, they claimed, the Superman character's copyright had been abandoned, and it did not matter whether or not Captain Marvel or his stories violated it. 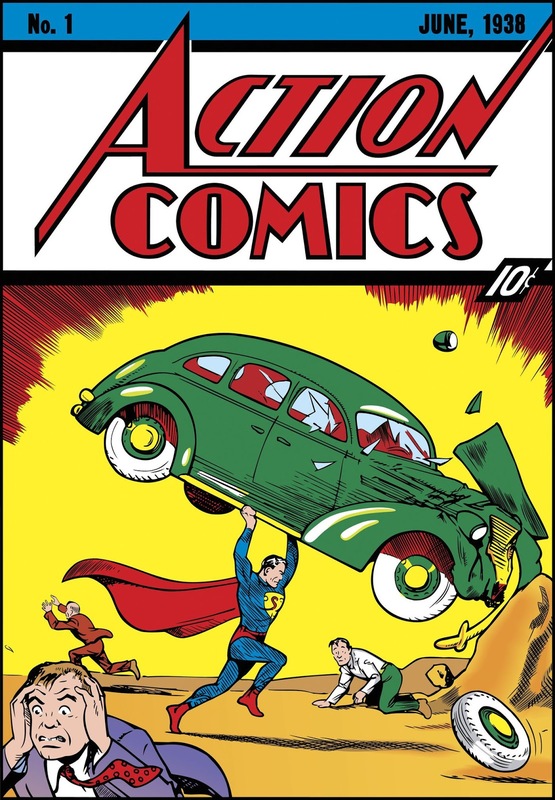 By the time the decision was handed down in 1950, Detective and it's sister company, Superman, Inc., had reorganized to form National Comics Publications, Inc. The U.S. District Court (93 F. Supp. 349) ruling recognized the similarities and differences between the characters and held that the character was not in violation of National's copyright. 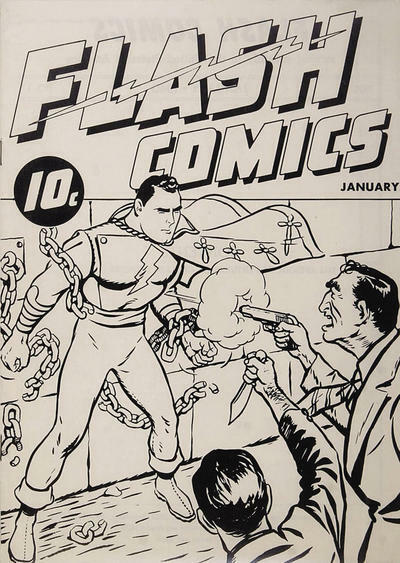 It did find that though there were conflicting testimonies by Fawcett employees as to whether there had been orders to copy Superman and Superman stories, the court was satisfied that copying did happen. However, the failure of Detective and McClure to ensure that appropriate copyright notices were affixed to at least 160 newspaper strips did constitute abandonment. Thus, Fawcett won the case. Of course National appealed. In 1951, Judge Learned Hand of the U.S. Second Circuit Court of Appeals (191 F.2d 594) decided that the inadvertent copyright omission did not constitute abandonment, and though Fawcett was not trying to deceive customers into thinking that Captain Marvel was Superman, copying of stories did happen. Copying of stories is an infringement of copyright. So National won. Now all that was left was to determine damages. 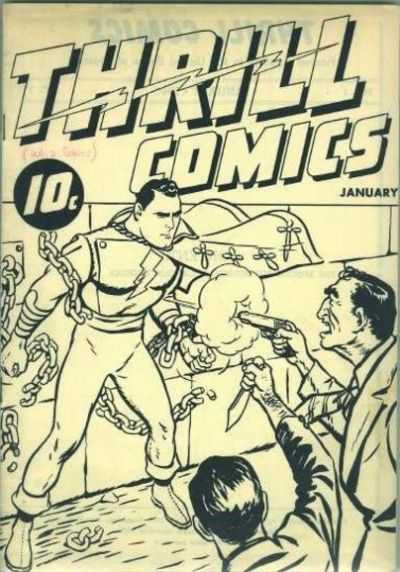 Damages were to be determined by finding every instance in which Fawcett's Captain Marvel stories copied National's Superman stories. This would have required many hours of cataloging over a decade's worth of comic books. By this time, sales of comic books had declined since their WWII peak, particularly in the area of Superheroes (though Captain Marvel was still popular). So Fawcett made the business-wise decision to settle with DC for $400,000 and agree not to publish Captain Marvel ever again. 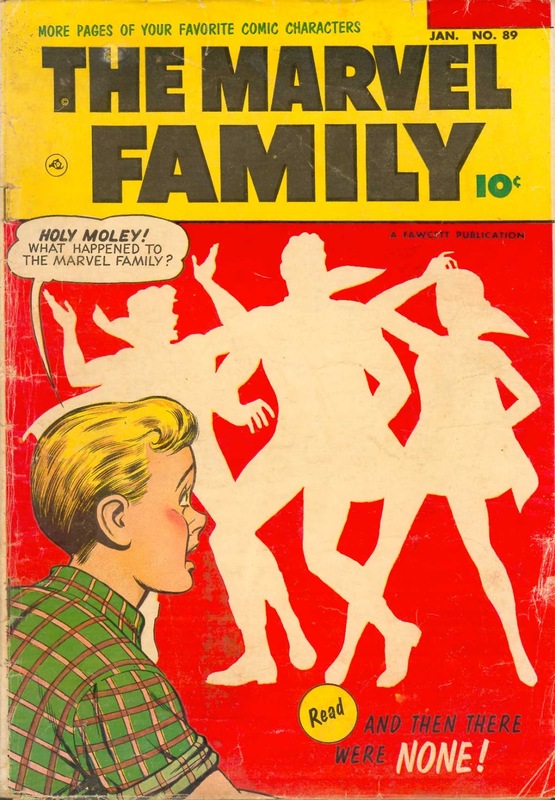 They closed down their comic book division, sold off a few of their properties to Charlton Comics, and their last issue was Marvel Family #89, cover dated January, 1954. NEXT: What happened next! Other Marvels! Other Companies! Other lawsuits! Aliens and androids and...oh my! (Almost) EVERY CAPTAIN MARVEL RANKED (by someone else)! CBR (ComicBookResource) has pulled out all the stops this time. 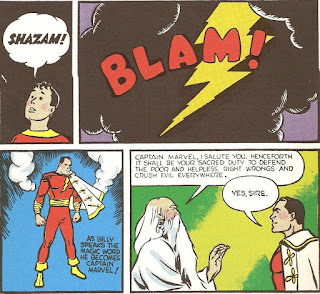 With the SHAZAM! and Captain Marvel movies in post-production and news items coming out every day, they posted an article that "ranks" 20 different Captain Marvels. This list is interesting for several reasons. 1. They combine all versions of the original Captain Marvel into one. 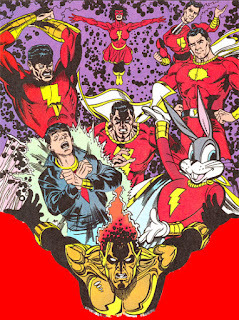 This enables these characters not to load up the list of course, but it also, then, counts the original Fawcett version (where the hero and the boy, Billy Batson, have different personalities) with the "New Beginning" version (where they have the same enthusiastic, youthful personality) with Jerry Ordway's "Power of SHAZAM!" version (in which Billy, as the hero for the first time, got all upset that he was made old and attacked the Old Wizard). I consider there to be enough differences between these and the other versions of the hero that DC has created by the name "Captain Marvel" that they should be considered separately in "rankings" like this. But then, there are space limitations, so CBR had to make some cuts somewhere, I'm sure. 2. 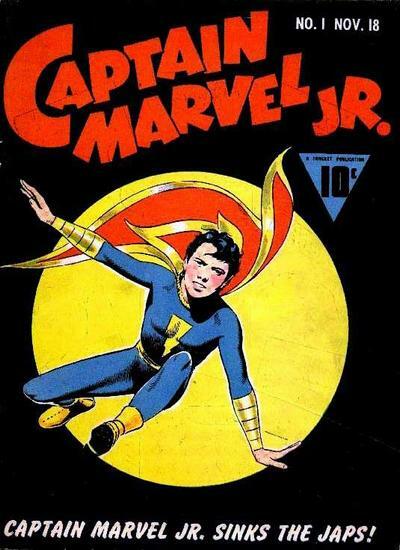 They pull some really obscure Captain Marvels out that even I have not heard of. I had apparently missed the "Age of Ultron" Marvel crossover event in 2013 and did not know that Janet Van Dyne (The Wasp) was Captain Marvel in an alternate timeline. I don't follow the Fantastic Four, generally, so I was not aware that in the alternate future of "Fantastic Four: The End" a character named Ayesha was Captain Marvel. 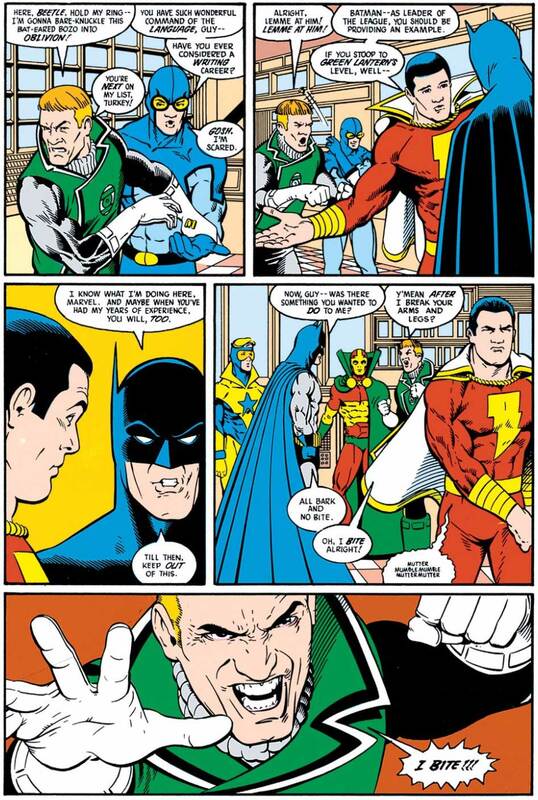 Marvel's Mangaverse is a foreign animal to me, so their Captain Marvel (who was Marvin Elwood, the son of Mar-Vell and Carol Danvers) was equally foreign (and where the heck did they get the name "Marvin Elwood?"). 3. They acknowledge some of the lesser-seen Captain Marvels of which I was at least aware. 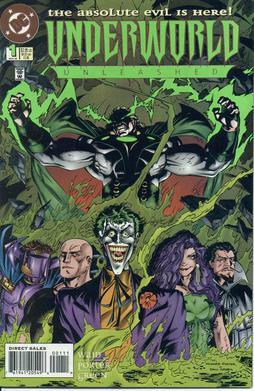 The Amalgam Captain Marvel combining Marvel and DC CMs only appeared in a few pages of Amalgam comics. Teddy ("Hulkling") Altman, son of Mar-Vell and a Skrull princess, was a Captain Marvel in a future timeline. "The Captain" of Nextwave (not their leader, but a superpowered guy who went by that name) said, in one panel, that he had tried the name "Captain Marvel." That these brief appearances did not escape CBR's notice impresses me. 4. They missed a few. In "Power of Shazam," Jerry Ordway wrote a story in which Dr. Sivana created an alternate timeline in which Billy Batson's parents were not killed. Thus, Billy and Mary never became Captain Marvels, but their mom and dad each did. I won't spoil it for you but there was some quality emotional drama. 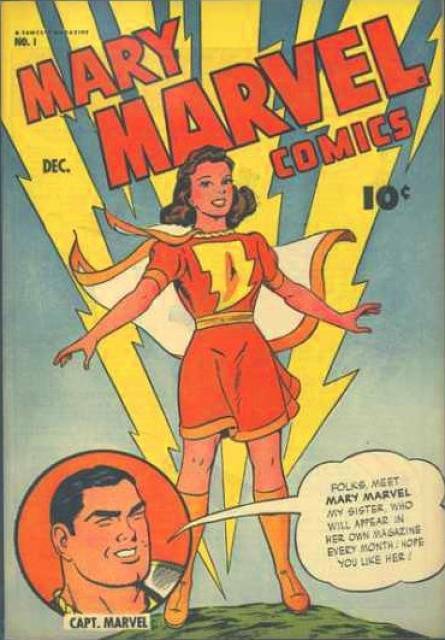 It was also the first appearance of a female "SHAZAM!" Captain Marvel in a white dress/costume. This white outfit became Mary's costume when the timeline went back to normal with not a comment made. This enabled the three lead members of the Marvel Family to be red, white, and blue. In the big, epic, trilogy of 12-issue limited series' Earth X/Universe X/Paradise X, Captain Mar-Vell appeared both as a small child and as dead, and the leader of an army of dead Kree warriors. I consider these to be different characters, being as it is a different timeline or something. 5. They give Monica Rambeau some respect. Marvel's second Captain Marvel (and the only one of them that has no connection to Mar-Vell) is listed as #4, after the Billy Batson, Carol Danvers, and Mar-Vell. In my opinion, she was a better "feminist superhero" than Carol Danvers' Ms. Marvel, because she was smart, professional, and did not need to have either her race or gender reflected in her name. There is nothing wrong with being proud or making a statement of one's race or gender, but it should be an optional thing, not one forced upon a character to highlight that aspect of them. She became leader of the avengers and did not have to go through any symbolic schizophrenic split personality drama. She never got her own title except for two one-shots in the early 1990's, and after she was dropped as leader of the Avengers she was barely ever seen, except in a niche supporting role. All things considered, the ranking is not very much beyond what I would have given. What do you think? What do you think? How would you rank the Captain Marvels? Post YOUR top 20 below! SHAZAM! trailer released at San Diego Comic Con! BREAKING~! HERE IT IS! Of the two movies based on Captain MArvel properties scheduled to come out next year, DC is the first one with an actual trailer! This is not completely surprising, being as their movie wrapped shooting faster and earlier,I expect the plot to be simpler, and it certainly has fewer tie-ins with other movies from its studio. So here we can see Asher Angel as Billy Batson finding his new foster home, Jack Dylan Grazer as his new foster-brother, Freddy, Mark Strong as Sivana, the super-powered (!) villain, at least one transformation into Zachary Levy as the hero, and a silhouetted Djimon Hounsou as the Wizard. ...and here some folks even did "mashups" of a bunch of them! I don't have time to watch and comment on all of them now, but I am keeping them here as a repository so that you and I can view them at our leisure later, especially after the movie comes out, and we can judge how right or wrong these reactions turned out to be! If you have a reaction to this trailer, either in video or text, please post it in the "comments" section, share this post, and subscribe to the Captain Marvel Culture blog! 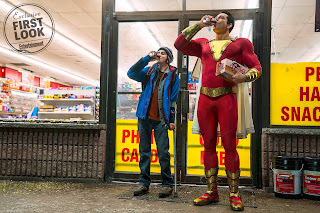 Well, the production has wrapped, and no doubt the various editors and special effects people are working their little tails off trying to make the new "SHAZAM!" movie as awesome as possible, and of course the PR department is working every bit as hard to make everyone THINK that it is as awesome as possible. ...which are essentially confirming what has been said about what this movie will be since the beginning: "Big" with superheroes (though there was one article that did not catch the "Big" was a movie title and presented the quotation as "...it's big with superheroes."). Sidenote: The director, David F. Sandberg, used Instagram to post cryptic pictures allegedly symbolizing the progress of his Journey as he researched and planned for the making of this movie. 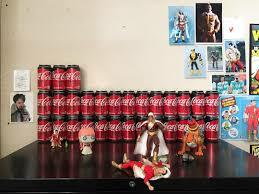 I wonder if the Coke cans in these pictures (below) had anything to to with the above scene? As a further sidenote, I must have missed this particular picture on Sandberg's Instagram. I was watching them the bet that I could, and was very heartened by the presence of Fawcett publications and action figures of the classic Captain Marvel. 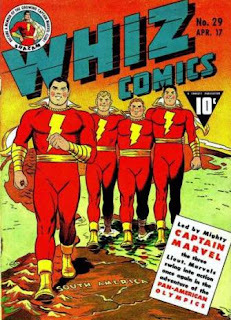 It made me think that maybe this movie would be about the original Captain Marvel, and not this New 52 character named "Shazam." Had I seen the picture above, I would have known those hopes were futile. In any event, that oft-repeated line, "'Big' with superheroes," kept on hitting me. The original Captain MArvel,. of which I am a fan, was not a boy in a grown-up's body, but ever since Roy Thomas created "SHAZAM! A New Beginning" after the "Crisis on Infinite Earths" in 1986, that has been the dominant interpretation of the hero. Sometimes it has led to some interesting dramatic story twists and turns, like in DC's "Underworld Unleashed" miniseries, "JSA" series from the 1990's, and "Young Justice" animated series. But all too often it has been played for goofy humor, starting with Keith Giffen's and Kevin McGuire's post-"Crisis" "Justice League." So now. apparently, someone showed some preview footage of the new movie in Ukraine, and thanks to the magic of the Internet (through which Asher Angel, who plays Billy Batson shared it), we can see it! THE HERO IS DOING THE "BIG" PIANO DANCE! 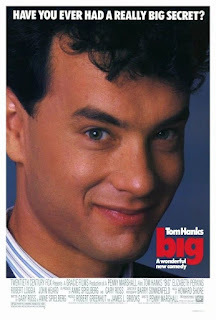 So that's why they have been harping on that early Tom Hanks movie! So that when people saw this scene they would get the pop-culture reference! But I really think that is a cheap joke. Aside from the fact that F.A.O. Schwartz, the world-famous toy store tin which the original scene took place, is not there any more, I will positively cringe if I have to watch the Zachary Levy as the hero dancing on a floor piano in a toy store! I was ready to accept that this character had a different name from the original hero. He was different enough that it was better that he not be named "Captain Marvel." But now...I just don't know if I can take it. So we see the Cola scene, some characters flying through the air as if hurled by the Force, and Mark Strong as Sivana catching the hero's punch. We also see flashes of the original New 52 story that introduced this character. This all confirms that this is an adaptation of the New 52 story, with Sivana's role enlarged to make up for the lack of Black Adam. It's all too brief to tell for sure how good it will look in its final form., andin the end, this film willbe judged on its execution. Hurry up and watch these clips, because Asher says he will be taking them down soon! You can see the full article from ComicBookMovie here. So what do you think of these clips? Post your impressions below and subscribe to this blog for the most insightful updates on the many different Captain Marvels!